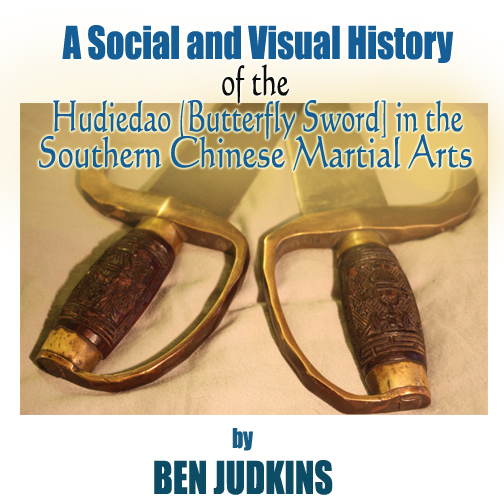 A Social and Visual History of the Hudiedao (Butterfly Sword) in the Southern Chinese Martial Arts. Hudiedao, wu dip do, bat cham do, shuang dao, double short broadswords, butterfly swords……These weapons are known by literally dozens of different names in the various styles and lineages of the southern Chinese martial arts. These schools can also be very particular about the exact knives that they favor. Nevertheless, all of these weapons seem to follow the same basic guidelines. The following article presents a brief investigation of the origin and use of these swords in the 19th century. This research is far from the last word on the topic and is subject to future revision. There is still a lot about the evolution of these weapons that we just do not understand, but hopefully this post will shed some light on the situation and suggest avenues for future research. 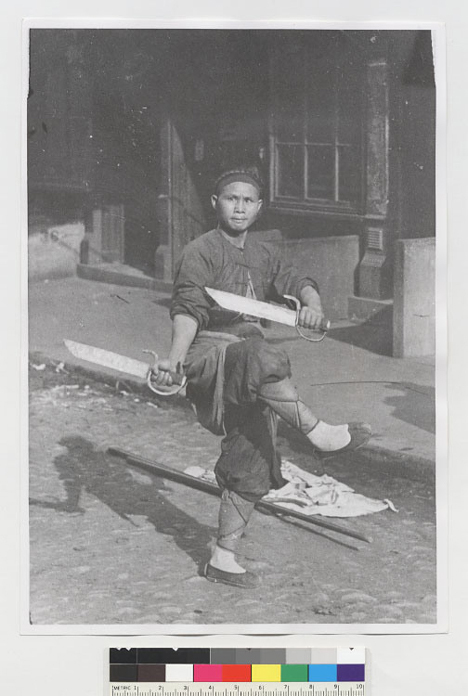 I would like to extend a special note of thanks to Swords and Antique Weapons for allowing me to use a number of wonderful photographs of hudiedao that have passed through their collection over the years. It would have been very difficult to present anything approaching a complete survey of the subject without their assistance. Introduction: What do we really know about butterfly swords? Ornately carved rosewood handles on a pair of 19th century hudiedao. This pair features both bat and floral motifs. The heavy brass handguards are shaped like bamboo and could easily be used as knuckle-dusters. Source: Authors personal collection. No weapon is more closely linked to the martial heritage of southern China than the hudiedao (Cantonese: wu dip do), commonly referred to in English as “butterfly swords.” In the hands of Wing Chun practitioners such as Bruce Lee and Ip Man, these blades became both a symbol of martial attainment and a source of regional pride for a generation of young martial artists. Nor are these blades restricted to a single style. Choy Li Fut, Hung Gar, Lau Gar and White Crane (among numerous others) all have lineages that employ this weapon. It is a widespread and distinctive cultural marker of the southern Chinese martial arts. This is not to say that hudiedaos are not occasionally seen in other places. They have been carried across China (and Asia) by the adventurous people of Guangdong and Fujian. There are also a number of other fighting traditions which focus on paired swords, daggers or maces that are very reminiscent of the butterfly swords of southern China. Still, there are distinctive elements of this regional tradition that make it both easily identifiable and interesting to study. The following post offers a brief history of the hudiedao. In attempting to reconstruct the origin and uses of this weapon I employ three types of data. First, I rely on dated photographs and engravings with a clear provenance. These images are important because they provide evidence as to what different weapons looked like and who carried them. Secondly, I discuss a number of period (1820s-1880s) English language accounts to help socially situate these weapons. 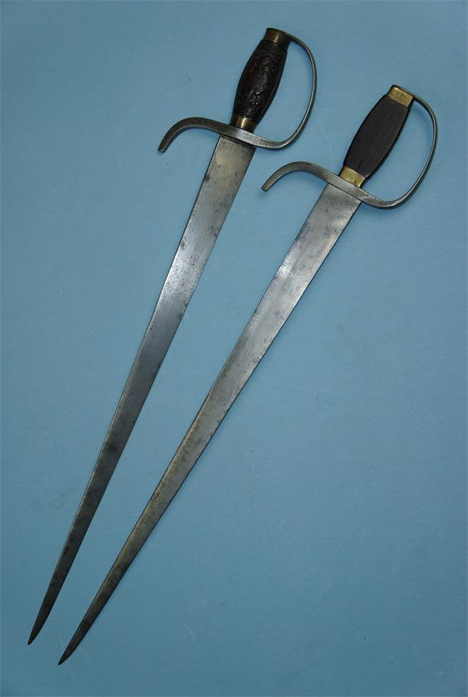 These have been largely neglected by martial artists, yet they provide some of the earliest references that we have to the widespread use of butterfly swords or, as they are always called in the period literature, “double swords.” While the authors of these accounts are sometimes hostile observers (e.g., British military officers), they often supply surprisingly detailed discussions of the swords, their methods of use and carry, and the wider social and military setting that they appeared in. These first-hand accounts are gold mines of information for military historians. Lastly, we will look at a number of surviving examples of hudiedao from modern private collections. It is hard to really understand what these weapons were capable of (and hence the purpose of the various double sword fighting forms found in the southern Chinese martial arts) without handling them. 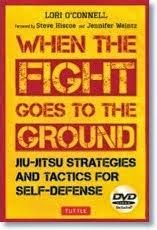 I think that modern martial artists expect both too much and too little from the hudiedao. With a few exceptions, the modern reproductions of butterfly swords are either beautifully made a-historical “artifacts,” high tech simulacra of a type of weapon that never actually existed in 19th century China, or cheaply made copies of practice gear that was never meant to be a “weapon” in the first place. This second class of “weapon” sets the bar too low, yet it is nearly impossible for any flesh and blood sword to live up to the mythology and hype that surrounds modern butterfly swords, especially in Wing Chun circles. Unfortunately period butterfly swords are hard to find and rather sought after by practicing martial artists and collectors around the world. They are usually too expensive or difficult for most southern style kung fu students to actually study. I hope that a detailed historical examination of these swords may help to fill in some of these gaps. While there is no substitute for holding a weapon in one’s hands, a good historical overview should at least give us a much better idea of what sort of weapon we are attempting to emulate. It will also teach us a little more about the milieu from which these blades emerged. This last point is an important one. Rarely do military historians or students of Chinese martial studies inquire about the social status or meaning of weapons. This is a serious oversight. As we have seen in our previous discussions of Republic era dadaos and military kukris, the social evolution of these weapons is often the most interesting and illuminating aspect of their story. Who used the hudiedao? How were they employed in combat? When were they first created, and what did they mean to the martial artists of southern China? The short answer to these questions is that butterfly swords were popular with civilian martial artists in the 19th century, and were never an official “regulation weapon” within the imperial Qing military. Yet even that response obscures more about Chinese martial society than it reveals. As Scott Phillips has argued, to be a “martial artist” in 19th century China was to also be a member in one or more other overlapping social groups (2010, “Theater, Ritual and Exorcism in Chinese Martial Arts”). For instance, many martial artists were one or more of the following: a professional soldier, a bandit or pirate, a member of a militia or clan defense society, a pharmacist or an entertainer. As we review the historical accounts and pictures below, we will see butterfly swords employed by members of each of these categories. That is precisely why this exercise is important. Hudiedao are a basic technology that help to tie the southern martial arts together. If we can demystify the development and spread of this one technology, we will make some progress toward understanding the background milieu that gave rise to the various schools of hand combat that we have today. A set of mid. 19th century hudiedao. These swords are 63 cm long have strong blades with a thick triangular spine (14 mm at the forte). They were capable of cutting but clearly optimized for stabbing. The edge itself has a convex grind on one side, and a flat grind where it sits against the other sword when sheathed. The blades also feature steel D-guards and rosewood handles decorated with carved phoenixes. This images was provided courtesy of http://www.swordsantiqueweapons.com, a reliable source for authentic antique Chinese arms. Hudiedao: Understanding the basic history of the butterfly sword. The monks of the Shaolin Temple have left an indelible mark on the martial arts of Guangdong and Fujian. This mark is none the less permanent given the fact that the majority of Chinese martial studies scholars have concluded that the “Southern Shaolin Temple” was a myth. Still, myths reflect important social values. Shaolin (as a symbol) has touched many aspects of the southern Chinese martial arts, including its weapons. In Wing Chun Schools today, it is usually assumed that the art’s pole form came from Jee Shim (the former abbot of the destroyed Shaolin sanctuary), and that the swords must have came from the Red Boat Opera or possibly Ng Moy (a nun and another survivor of temple). A rich body of lore linking the hudiedao to Shaolin has grown over the years. These myths often start out by apologizing for the fact that these monks are carrying weapons at all, as this is a clear (and very serious) breach of monastic law. It is frequently asserted that our monks needed protection on the road from highwaymen, especially when they were carrying payments of alms. Some assert that butterfly swords were the only bladed weapons that the monks were allowed to carry because they were not as deadly as a regular dao. The tips could be left blunt and the bottom half of the blade was often unsharpened. Still, there are a number of problems with this story. These blunt tips and unsharpened blades seem to actually be more of an apology for the low quality, oddly designed, practice swords that started to appear in the 1970s than an actual memory of any real weapons. The first probable references to the hudiedao (or butterfly swords) that I have been able to find date to the 1820s. Various internet discussions, some quite good and worth checking out, as well as Jeffery D. Modell’s article “History & Design of Butterfly Swords” (Kung Fu Tai Chi Magazine, April 2010, pp. 56-65) usually suggest a later date of popularization. Modell concludes that the traditional butterfly sword is a product of the “late 19th century” while other credible sources generally point to the 1850s or 1860s. The general consensus seems to be that while a few examples may have existed earlier, this weapon did not really gain prominence until the middle or end of the 19th century. This opinion was formed mostly through the first hand examination of antique blades. And it is correct so far as it goes. Most of the existing antique blades do seem to date from the end of the 19th century or even the first few decades of the 20th. Further, this would fit with our understanding of the late 19th century being a time of martial innovations, when much of the foundation for the modern Chinese hand combat systems was being set in place. Recently uncovered textual evidence would seem to indicate that we may need to roll these dates back by a generation or more. As we will see below, already in the 1820s western merchants and British military officers in Guangzhou were observing these, or very similar weapons, in the local environment. They were even buying examples that are brought back to Europe and America where they enter important early private collections. The movement of both goods and people was highly restricted in the “Old China Trade” system. Westerners were confined to one district of the Guangzhou and they could only enter the city for a few months of the year. The fact that multiple individuals were independently collecting examples of hudiedao, even under such tight restrictions, would seem to indicate that these weapons (or something very similar to them) must have already been fairly common in the 1820s. Accounts of these unique blades become more frequent and more detailed in the 1830s and 1840s. Eventually engravings were published showing a wide variety of arms (often destined for the private collections or the “cabinets” or wealthy western individuals), and then from the 1850s onward a number of important photographs were produced. The Hudiedao started to appear in images on both sides of the pacific, and it is clear that the weapon had a well-established place among gangsters and criminals in both San Francisco and New York. But what exactly is a hudiedao? What sorts of defining characteristics binds these weapons together and separate them from other various paired weapons that are seen in the Chinese martial arts from time to time? Readers should be aware that not every “double sword” is a hudiedao. This is a pair of jians dating to the late 19th century. Notice that this style of swords is quite distinct on a number of levels. Rather than being fit into a simple leather scabbard with a single opening, these swords each rest in their own specially carved compartment. As a result the blades are not flat-ground on one side (as is the case with true hudiedao) and instead have the normal diamond shaped profile. 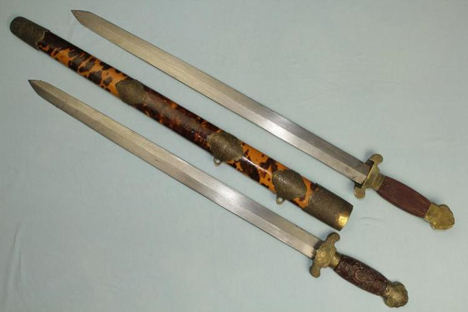 These sorts of double swords are more common in the northern Chinese martial arts and also became popular in the late 19th and early 20th century. 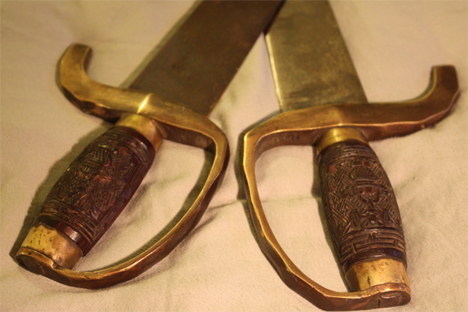 They are usually called Shuang Jain (or Shuang Dao for a single edged blade), literally “double swords. Unfortunately, this is exactly the same term that many English language observers used when they encountered Hudiedao in Guangzhou and Hong Kong in the middle of the 19th century. Further complicating the matter, some southern fighting forms call for the use of two normal sabers to be used simultaneously, one in each hand. Interpreting 19th century accounts of “double swords” requires a certain amount of guess work. Photos courtesy of http://www.swordsantiqueweapons.com. Note the construction of the scabbard. Period sources seem to imply that swords were classified in large part by their scabbard construction (how many openings the blades shared), and not just by the blades shape or function. these images were provided courtesy of http://www.swordsantiqueweapons,com. It is interesting to note that the term “hudiedao,” or “butterfly sword,” never appears in any of the 19th century English language accounts that I have examined. Invariably these records and illustrations refer instead to “double swords.” A number of them go to lengths to point out that this is a weapon unique to China. Its defining characteristic seems to be that the two blades are fitted together in such a way that they can be placed in a shared opening to one sheath. Some accounts (but not all) go on to describe heavy D guards and the general profile of the blade. I used these more detailed accounts (from the 1830s) and engravings and photos (from the 1840s and 1850s) to try and interpret some of the earlier and briefer descriptions (from the 1820s). Some of these collectors, Dunn in particular, were quite interested in Chinese culture and had knowledgeable native agents helping them to acquire and catalog their collections. It is thus very interesting that these European observers, almost without exception, referred to these weapons as “double swords” rather than “butterfly swords.” Not to put too fine a point on it, but some western observers seemed to revel in pointing out the contradictory or ridiculous in Chinese culture, and if any of them had heard this name it would have recorded, if only for the ridicule and edification of future generations. Multiple important early Chinese novels, including the Romance of the Three Kingdoms and Water Margin (All Men are Brothers) include protagonists who use these weapons, so for that reason alone this would be a commonly understood term. Even individuals who were not martial artists would have known about these literary characters and their weapons. In fact, the literary legacy of those two novels could very well explain how these blades have managed to capture the imagination of so many martial artists up through the 21st century. In modern martial arts parlance, “double swords” (shuang jian or shuang dao) refer to two medium or full size jians (or daos) that are fitted into a single scabbard. These weapons also became increasingly popular in the late 19th century and are still used in a variety of styles. It is possible that they are a different regional expression of the same basic impulse that led to the massive popularization of hudiedao in the south, but they are a fairly different weapon. The real complicating factor here is that neither type of weapons (shuang dao vs. hudiedao) was ever adopted or issued by the Imperial military, so strictly speaking, neither of them have a proper or “official name.” Instead we are left with a wide variety of, often poetic, ever evolving terms favored by different civil societies and martial arts styles. Occasionally it is unclear whether these style names are actually meant to refer to the weapons themselves, or the routines that they are employed in. The evolution of the popular names of these weapons seems almost calculated to cause confusion. For our present purposes I will be referring to any medium length, single edged, pair of blades fitted into a shared scabbard, as “hudiedaos.” Readers should be aware of the existence of a related class of weapon which resembles a longer, single, hudiedao. These were meant to be used in conjunction with a rattan shield. They are only included in my discussion only if they exhibit the heavy D-guard and quillion that is often seen on other butterfly swords. Hudiedao were made by a large number of local smiths and they exhibit a great variability in form and intended function. Some of these swords are fitted with heavy brass D-guards (very similar to a European hanger or cutlass), but in other cases the guard is made of steel. On some examples the D-guard is replaced with the more common Chinese S-guard. And in a small minority of cases no guard was used at all. Another set of Hudiedao exhibiting different styling. An S-guard is used on these swords, which are more common on Chinese weapons. These knives are 45 cm long and are both shorter and lighter than some of the preceding examples. Photo courtesy of http://www.swordsantiqueweapons.com. The sorts of blades seen on hudiedao from southern China can also vary immensely. Two types are most commonly encountered on 19th century weapons. Some are long and narrow with a thick triangular cross section. These blades superficially resemble shortened European rapiers and are clearly designed with stabbing in mind. Other blades are wider and heavier, and exhibit a sturdy hatchet point. While still capable of stabbing through heavy clothing or leather, these knives can also chop and slice. Most hudiedao from the 19th century seem to be medium sized weapons, ranging from 50-60 cm (20-24 inches) in length. It is obvious that arms of this size were not meant to be carried in a concealed manner. To the extent that these weapons were issued to mercenaries (or “braves”), local militia units or civilian guards, there would be no point in concealing them at all. Instead, one would hope that they would be rather conspicuous, like the gun on the hip of a police officer. These hudiedaos have thick brass grips, a wider blade better suited for chopping and a strong hatchet point. Their total length is just over 60 cm. This was the most commonly produced type of “butterfly sword” during the middle of the 19th century. Photo courtesy of http://www.swordsantiqueweapons.com. While these two blade types are the most common (making up about 70% of the swords that I have encountered), other shapes are also seen. 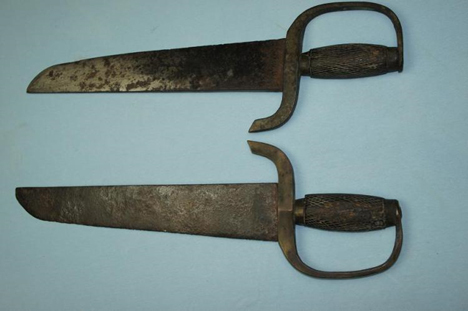 Some hudiedao exhibit the “coffin” shaped blades of traditional southern Chinese fighting knives. These specimens are very interesting and often lack any sort of hand guard at all, yet they are large enough that they could not easily be used like their smaller cousins. One also encounters blades that are shaped like half-sized versions of the “ox-tail” dao. This style of sword was very popular among civilian martial artists in the 19th century. Occasionally blades in this configuration also show elaborate decorations that are not often evident on other types of hudiedao. This set of Butterfly Swords has a number of unusual features. Perhaps the most striking are its wood (rather than leather) scabbard and high degree on ornamentation. These were almost certainly collected in French Indo-China and likely date to 1900-1930. They are 49 cm in length and show a pronounced point. Photo courtesy of http://www.swordsantiqueweapons.com. These unusual hudiedao feature handles and blades that are loosely based on traditional Chinese fighting knives. In this case the blade has been made both longer and wider. Fighting knives do not commonly have hand guards, which are also missing from this example. I have seen a couple of sets of knives in this configuration, though they seem to be quite rare. These knives are 49 cm long and 65 mm wide at the broadest point. Possibly early 20th century. Photo courtesy of http://www.swordsantiqueweapons.com. These hudiedao are more reminiscent of the blades favored by modern Wing Chun students. They show considerable wear and date to either the middle or end of the 19th century. The tips of the blades are missing and may have been broken or rounded off through repeated sharpening. I suspect that when these swords were new they had a more hatchet shaped tip. Their total length is 49 cm. Photo courtesy of http://www.swordsantiqueweapons.com. Lastly there are shorter, thicker blades, designed with cutting and hacking in mind. These more closely resemble the type favored by Wushu performers and modern martial artists. Some of these weapons could be carried in a concealed manner, yet they are also better balanced and have a stronger stabbing point than most of the inexpensive replicas being made today. It is also interesting to note that these shorter, more modern looking knives, can be quite uncommon compared to the other blade types listed above. I am hesitant to assign names or labels to these different sorts of blades. That may seem counter-intuitive, but the very existence of “labels” implies a degree of order and standardization that may not have actually existed when these swords were made. 19th century western observers simply referred to everything that they saw as a “double sword” and chances are good that their Chinese agents did the same. Given that most of these weapons were probably made in small shops and to the exact specifications of the individuals who commissioned them the idea of different “types” of hudiedao seems a little misleading. What defined a “double sword” to both 19th century Chinese and western observers in Guangdong, was actually how they were fitted and carried in the scabbard. These scabbards were almost always leather, and they did not separate the blades into two different channels or compartments (something that is occasionally seen in northern double weapons). Beyond that, a wide variety of blade configurations, hand guards and levels of ornamentation could be used. I am still unclear when the term “hudiedao” came into common use, or how so many independent observers and careful collectors could have missed it. This engraving, published in 1801, is typical of the challenges faced when using cross-cultural sources in an attempt to reconstruct Chinese martial history. 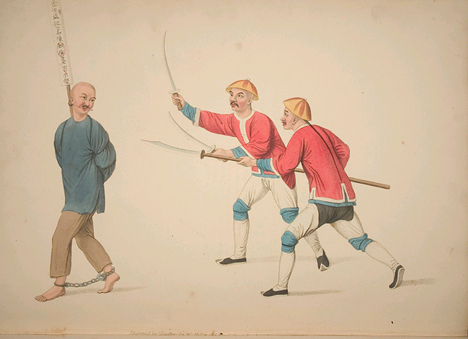 The image is plate number 20 from Major George Henry Mason’s popular 1801 publication Punishments of China (St James: W. Bulmer and Co.). Mason was in Guangzou (recovering from an illness) in 1789-1790. Given his experience in China, and interests in day to day life, he should have been a keen social observer. So how reliable are his prints? Does this image really show a soldier holding an early form of hudiedao, or something like them? It is actually quite hard to know what Mason actually saw or what to make of a print like this. Mason’s engravings were all based on watercolor paintings that he purchased from a Cantonese artist in Guangzhou named Pu Qua (Timothy Brook, Jérôme Bourgon, Gregory Blue. Death by a Thousand Cuts. Harvard University Press. 2008. P. 171). So what we really have here is an impressionistic engraving based off of a quickly sketched water color. While this image clearly suggests that some members of the local Yamen were using two medium sized swords, it is difficult to hazard a guess as to what the exact details of these weapons were. I attempt to avoid this type of problem by relying on first-hand accounts and more detailed (often photographic) images. The First Written Accounts: Chinese “double swords” in Guangzhou in the 1820s-1830s. The first English language written account of what is most likely a hudiedao that I have been able to find is a small note in the appendix of the Transactions of the Royal Asiatic Society for the year 1827. Lieutenant Colonel Charles Joseph Doyle had evidently acquired an extensive collection of oriental arms that he wished to donate to the society. In an era before public museums, building private collections, or “cabinets,” was a popular pastime for members of a certain social class. If Doyle’s entry in the records of the Royal Asiatic Society was terse, another prominent collector from the 1820 was more effusive. Nathan Dunn is an important figure in America’s growing understanding of China. He was involved in the “Old China Trade” and imported teas, silks and other goods from Guangdong to the US. Eventually he became very wealthy and strove to create a more sympathetic understanding of China and its people in the west. For a successful merchant, his story begins somewhat inauspiciously. Historical records show that in 1816 Nathan Dunn was disowned (excommunicated) by the Philadelphia Monthly Meeting of the Religious Society of Friends (the Quakers) for bankruptcy. While socially devastating, this bankruptcy may have been the best thing that ever happened to Dunn. In 1818 he left for China on a risky trading mission in an attempt to rebuild his fortune. He succeeded in that task many times over. Unlike most western merchants Dunn found the Chinese to be very intelligent and worthy of close study and contemplation. He objected strenuously to the selling of opium (an artifact of his prior Quaker faith) and made valuable friendships and alliances with individuals from all levels of Chinese society. Appreciating his open outlook these individuals helped Dunn to amass the largest collection of Chinese artifacts in the hands of any one individual. In fact, the Chinese helped Dunn to acquire a collection many times larger than the entire cabinets of both the British East India Company and the British Government, which had been trying to build a vast display of its own for years. Dunn’s collection was also quite interesting for its genuine breadth. It included both great works of art and everyday objects. It paid attention to issues of business, culture, horticulture and philosophy. Dunn made a point of studying the lives of individuals from different social and economic classes, and he paid attention to the lives and material artifacts of women. Finally, like any good 19th century gentleman living abroad, he collected arms. Dunn’s collection went on display in Philadelphia in the 1838’s. When it opened to the public he had an extensive catalog printed (poetically titled 10,000 Chinese Things), that included in-depth discussions of many of the displays. This sort of contextual data is quite valuable. It is interesting to not only see double swords mentioned multiple times in Dunn’s collection, but to look at the other weapons that were also employed in the 1820s when these swords were actually being bought in Guangdong. “In addition to the spears upon the wall, there are two bows; one strung, and the other unstrung; two pair of double swords; one pair with a tortoise shell, and the other a leather sheath; besides several other swords and caps, and a jinjall, or a heavy gun on a pivot, which has three movable chambers, in which the powder and ball are put, and which serve to replace each other as often as the gun is discharged.” P. 93. Enoch Cobb Wines. A Peep at China in Mr. Dunn’s Chinese Collection. Philadelphia: Printed for Nathan Dunn. 1839. I found it interesting that Dunn would associate the double sword with “hamstringing” (the intentional cutting of the Achilles tendon) an opponent. In his 1801 volume on crime and punishment George Henry Mason included an illustration of a prisoner being “hamstrung” with a short, straight bladed knife. This was said to be a punishment for attempting to escape prison or exile. He noted that there was some controversy as to whether this punishment was still in use or if legal reformers in China had succeeded in doing away with it. It is possible that Dunn’s description (or more likely, that of his Chinese agent) on page 51 is a memory of the “judicial” use of the hudiedao by officers of the state against socially deviant aspects of society. These are the earliest references to “double swords” in southern China that I have been able to locate. Already by the 1820s these weapons were seen as something uniquely Chinese, hence it is not surprising that they would find their way into the collections and cabinets of early merchants and military officers. Still, the 1820s was a time of relatively peaceful relations between China and the West. Tensions built throughout the 1830s and boiled over into open conflict in the 1840s. As one might expect, this deterioration in diplomatic relations led to increased interest in military matters on the part of many western observer. Numerous detailed descriptions of “double swords” emerge out of this period. It is also when the first engravings to actually depict these weapons in a detailed way were commissioned and executed. Karl Friedrich A. Gutzlaff (English: Charles Gutzlaff; Chinese: Guō Shìlì) was a German protestant missionary in south-eastern China. He was active in the area in the 1830s and 1840s and is notable for his work on multiple biblical translations. He was the first protestant missionary to dress in Chinese style and was generally more in favor of enculturation than most of his brethren. He was also a close observer of the Opium Wars and served as a member of a British diplomatic mission in 1840. One of his many literary goals was to produce a reliable and up to date geography of China. Volume II of this work spends some time talking about the Chinese military situation in Guangdong. While discussing the leadership structure of the Imperial military we find the following note: (In a discussion of the “Chamber for the superintendent of stores and the examination of military candidates. ): “Chinese bows are famous for carrying to a great distance; their match-locks are wretched fire-arms; and upon their cannon they have not yet improved, since they were taught by the Europeans. Swords, spears, halberts, and partisans, are likewise in use in the army. Two swords in one scabbard, which enable the warrior to fight with the left and right hands, are given to various divisions. They carry rattan shields, made of wicker work, and in several detachments they receive armour to protect their whole body. The officers, in the day of battle, are always thus accoutered. Of their military engines we can say very little, they having, during a long peace, fallen into disuse.” P. 446. Karl Friedrich A. Gützlaff. China opened; or, A display of the topography, history… etc. of the Chinese Empire. London: Smith, Elder and Co. 1838. This is an interesting passage for a variety of reasons. It seems to very strongly suggest that the Green Standard Army in Guangdong were using hudiedao (or some type of “double sword”) in the 1830s, or at least stockpiling them. Occasionally I hear references to hudiedao being found that have official “reign marks” on them, or property marks of the Chinese military. I have never seen one of these knives and cannot judge the veracity of the claim. The conventional wisdom (as we will see below) is that “double swords” were never a “regulation” weapon and were instead issued only to civilian “braves” and gentry led militia units which were recruited by the governor of Guangdong in his various clashes with the British. Still, this note falls right in the middle of an extensive discussion of the command structure of the Imperial military. Who these various divisions were, and what relationship they had with militia troops, is an interesting question for further research. 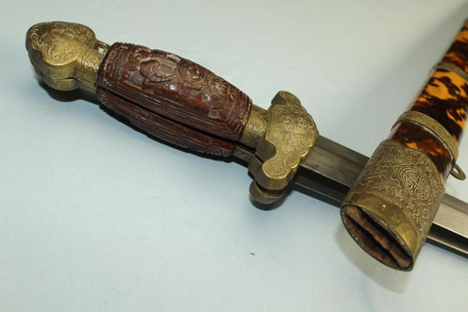 This is an interesting example of a single “hudiedao.” It was never issued with a companion and has a fully round handle meaning that it cannot be slid into a scabbard besides another weapon. 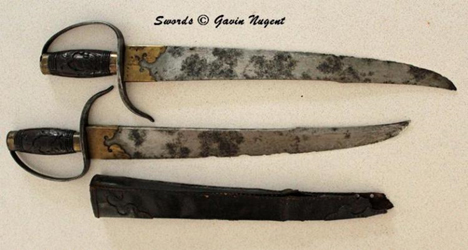 Short swords such as these were often issued to militia members who were armed with rattan shields. While not strictly the same as a hudiedao, its clear that this weapon is taking its styling cues from these other swords. The style of its leather scabbard, hilt and hand-guard are all identical to what was see on period “butterfly swords.” This example measures 60 cm in length and would have been a good general short-range weapon. Photo courtesy of http://www.swordsantiqueweapons.com. The Asiatic Journal and Monthly Register for British and Foreign India, China and Australia. May-August, 1840. London: Wm. H. Allen and Co. Such new recruits would clearly have been both “Braves” and members of the gentry led militia system. So this would seem to indicate that the hudiedao was a weapon favored by martial artists and citizen soldiers. This is also the first reference I have seen to soldiers beating their hudiedao together to make a clamor before charging into battle. While this tactic is usually noted with disdain by British observers, it is well worth noting that their own infantry often put on a similar display before commencing a bayonet charge. Another set of hudiedao from the private collection of Gavin Nugent. These blades are some of the earliest seen in this post. They also show signs of significant period use. Note the complex profile of the blades and how the spine flattens out as it approaches the tip. This allows the weapon to have reach while not feeling “top heavy.” The owner notes that these are the most comfortable hudiedao that he has handled. The nicely executed brass tunkou (collar around the blade) are an interesting and rarely seen feature. Source: http://www.swordsantiqueweapons.com. Born in 1805 (1805-1878) J. Elliot Bingham served for 21 years in the Royal Navy. In the late 1830s he had the rank of First Lieutenant (he later retired as a Commander) and was assigned to the H. M. S. Modeste. Launched in 1837, this 18 Gun Sloop or corvette was crewed by 120 sailors and marines. It saw repeated combat along the Guangdong coast and the Pearl River between 1839 and 1841. As a military man Commander Bingham was a close observer of Chinese weapons and he leaves us with what must be considered the very best account of the use of hudiedao by militia troops in the late 1830s. “March the 21st, Lin was busy drilling 3,000 troops, a third portion of which was to consist of double-sworded men. These twin swords, when in scabbard, appear as one thick clumsy weapon, about two feet in length; the guard for the hand continuing straight, rather beyond the “fort” of the sword turns toward the point, forming a hook about two inches long. When in use, the thumb of each hand is passed under this hook, on which the sword hangs, until a twist of the wrist brings the grip within the grasp of the swordsman. Clashing and beating them together and cutting the air in every direction, accompanying the action with abuse, noisy shouts and hideous grimaces, these dread heroes advance, increasing their gesticulations and distortions of visage as they approach the enemy, when they expect the foe to become alarmed and fly before them. Lin had great faith in the power of these men.” P. 177-178. J. Elliot Bingham. Narrative of the Expedition to China, from the Commencement of the Present Period. Volume 1. London: Henry Colburn Publisher. 1842. Commander Bingham was not much impressed by the Chinese militia or their exotic weaponry. In truth, Lin led his forces into a situation where they were badly outgunned, and more importantly “out generaled,” by the seasoned and well led British Navy. Still, his brief account contains a treasure trove of information. 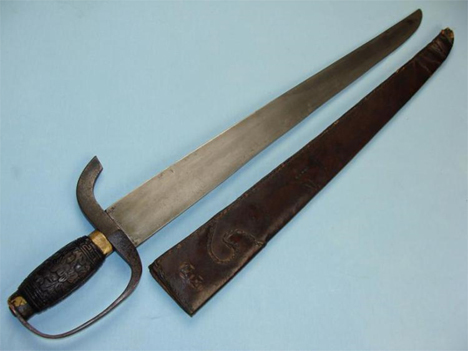 To begin with, it confirms that the earlier accounts of “double swords” used by the militia in and around Guangzhou in the 1830s were in fact references to hudiedao. Fredric Wakeman, in his important study Stranger at the Gate: Social Disorder in Southern China 1839-1861, cites intelligence reports sent to the British Foreign Office which claim that Lin had in fact raised a 3,000 man force to repel a foreign attach on Guangzhou. Apparently Lin distrusted the ability of the Green Standard Army to get the job done, and the Manchu Banner Army was so poorly disciplined and run that he actually considered it to be a greater threat to the peace and safety of the local countryside than the British. He planned on defending the provincial capital with a two pronged strategy. First, he attempted to strengthen and update his coastal batteries. Secondly, he called up the gentry led militia (and a large number of mercenary braves) because these troops were considered more committed and reliable than the official army. Bingham was correct, Lin did put a lot of confidence in the militia. The Foreign Office reported that Lin ordered every member of the militia to be armed with a spear, a rattan helmet, and a set of “double swords” (Wakeman 95). Other reports note that members of the militia were also drilled in archery and received a number of old heavy muskets from the government stores in Guangdong. Bingham’s observations can leave no doubt that the “double swords” that the Foreign Office noted were in fact hudiedao. Local members of the gentry worked cooperatively out of specially built (or appropriated) Confucian “schools” to raise money, procure arms and supplies for their units, to organize communications systems, and even to create insurance programs. It seems likely that the hudiedao used by the militia would have been hurriedly produced in a number of small shops around the Pearl River Delta. Much of this production likely happened in Foshan (the home of important parts of the Wing Chun, Choy Li Fut and Hung Gar movements). Foshan was a critical center of regional handicraft production, and it held the Imperial iron and steel monopoly (He Yimin. “Thrive and Decline:The Comparison of the Fate of “The Four Famous Towns” in Modern Times.” Academic Monthly. December 2008.) This made it a natural center for weapons production. We know, for instance, that important cannon foundries were located in Foshan. The battle for control of these weapon producing resources was actually a major element of the “Opera Rebellion,” or “Red Turban Revolt,” that would rip through the area 15 years later. (See Wakeman’s account in Stranger at the Gate for the most detailed reconstruction of the actual fighting in and around Foshan.) Given that this is where most of the craftsmen capable of making butterfly swords would have been located, it seems reasonable to assume that this was where a lot of the militia weaponry was actually produced. Further, the town’s centralized location on the nexus of multiple waterways, and its long history of involvement in regional trade, would have made it a natural place to distribute weapons from. While all 3,000 troops may have been armed with hudiedao, it is very interesting that these weapons were the primary arms of about 1/3 of the militia. Presumably the rest of their comrades were armed with spears, bows and a small number of matchlocks. Bingham also gives us the first clear description of the unique hilts of these double swords. He notes in an off-handed way that they have hand-guards. More interesting is the quillion that terminates in a hook that extends parallel to blade for a few inches. This description closely matches the historic weapons that we currently possess. This style of guard, while not seen on every hudiedo, is fairly common. It is also restricted to weapons from southern China. Given that this is not a traditional Chinese construction method, various guesses have been given as to how these guards developed and why they were adopted. There is at least a superficial resemblance between these guards and the hilts of some western hangers and naval cutlasses of the period. It is possible that the D-guard was adopted and popularized as a result of increased contact with western arms in southern China. If so, it would make sense that western collectors in Guangzhou in the 1820s would be the first observers to become aware of the new weapon. The actual use of the hooked quillion is also open to debate. Many modern martial artists claim that it is used to catch and trap an opponent’s blade. In my next post I will review a martial arts training manual from the 1850s that shows local boxers attempting to do exactly this. However, as the British translator of that manual points out (and I am in total agreement with him), this cannot possibly work against a longer blade or a skilled and determined opponent. While this type of trapping is a commonly rehearsed “application” in Wing Chun circles, after years of fencing practice and full contact sparring, my own school has basically decided that it is too dangerous to attempt and rarely works in realistic situations. Another theory that has been advanced is that the hook is basically symbolic. It is highly reminiscent of the ears on a “Sai,” a simple weapon that is seen in the martial arts of China, Japan and South East Asia. Arguments have been made that the sai got its unique shape by imitating tridents in Hindu and Buddhist art. Perhaps we should not look quite so hard for a “practical” function for everything that we see in martial culture (Donn F. Draeger. The Weapons and Fighting Arts of Indonesia. Tuttle Publishing. 2001. p. 33). Bingham makes a different observation about the use of the quillion. He notes that it can be used to manipulate the knife when switching between a “reverse grip” and a standard fencing or “brush grip.” Of course the issue of “sword flipping” is tremendously controversial in some Wing Chun circles, so it is interesting to see a historical report of the practice in a military setting in the 1830s. A very nice set of mid. 19th century hudiedao. These pointed stabbing blades are 63 cm long, 40 mm wide at the base, and the spine in 14 mm across, giving the entire weapon a strong triangular profile. Image courtesy of http://www.swordsantiqueweapons.com. Early Images of the Hudiedao: Western Engravings of Chinese Arms. It was rare to encounter collections of Chinese artifacts of any kind in the 1820s and 1830s. However, the situation changed dramatically after the First and Second Opium Wars. The expansion of trade that followed these conflicts, the opening of new treaty ports, and the creation and growth of Hong Kong all created new zones where Chinese citizens and westerners could meet to change goods and artifacts of material culture. Unfortunately these meetings were not always peaceful and a large number of Chinese weapons started to be brought back to Europe as trophies. Many of these arms subsequently found their way into works of art. As a quintessentially mysterious Chinese weapon, “double swords” were featured in early engravings and photographs. 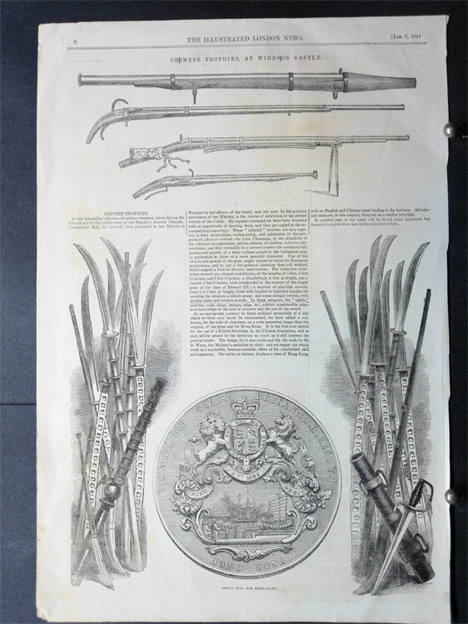 Our first example comes from an engraving of Chinese weapons captured by the Royal Navy and presented to Queen Victoria in 1844. The London Illustrated News published an interesting description of what they found. In addition to a somewhat archaic collection of firearms, the Navy recovered a large number of double handed choppers. 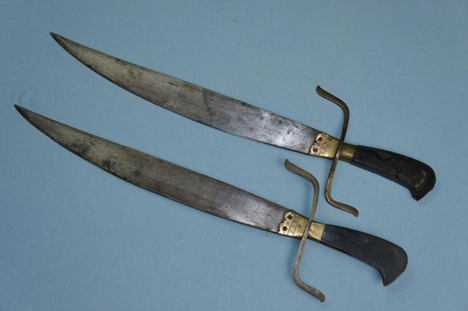 These most closely resemble weapon that most martial artists today refer to as a “horse knife” (pu dao). Featured prominently in the front of the engraving is something that looks quite familiar. The accompanying article describes this blade as having “two sharpened edges” and a “modern guard.” I have encountered a number of hudiedao with a false edge, but I do not think that I have found one that was actually sharpened. I suspect that the sword in this particular picture was of the single variety and originally intended for use with a wicker shield. London Illustrated News, January 6th, 1844. P. 8. 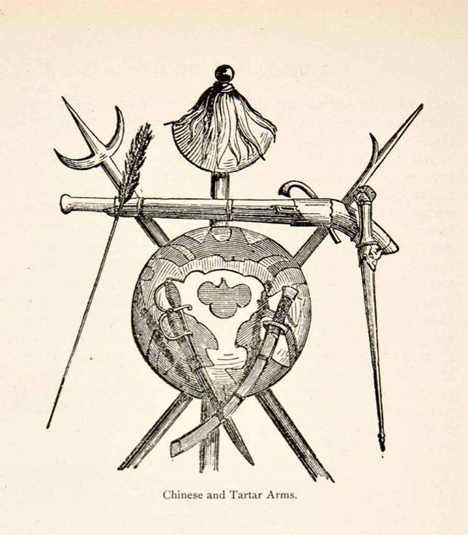 Another useful engraving of “Chinese and Tartar Arms” can be found in Evariste R. Huc’s Travels in Tartary, Thibet and China (London, 1852). Unlike some of the previous sources this one is not overly focused on military matters. Still, the publishers include a fascinating engraving of Chinese arms. The models for these were likely war trophies that were brought to the UK in the 1840s and 1850s. They may have even been items from Nathan Dunn’s (now deceased) vast collection which was auctioned at Sotheby in 1844 following a brief tour of London. Featured prominently in the middle of the picture is a set of hudiedao. The engraving shows two swords with long narrow blades and D-guards resting in a single scabbard. It is very hard to judge size in this print as the artist let scale slide to serve the interests of symmetry, but it appears that the “double swords” are only slightly shorter than the regulation Qing dao that hangs with them. “Chinese and Tartar Arms.” Published in Evariste R. Huc. Travels in Tartary, Thibet and China, 1844-5-6. Volume 1. P. 237. Office of the National Illustrated Library. London: 1852. While it would appear that hudiedao had been in use in southern China since the 1820s, they make their first documented appearance on the West coast of America in the 1850s. The Bancroft Library at UC Berkley has an important collection of documents and images relating to the Chinese American experience. Better yet, many of their holdings have been digitized and are available on-line to the public. Most of the Chinese individuals who settled in California (to work in both the railroads and mining camps) were from Fujian and Guangdong. They brought with them their local dialects, modes of social organization, tensions and propensity for community feuding and violence. They also brought with them a wide variety of weapons. This may be correct, but I have not been able to locate any firm early accounts linking the two in China. However, a careful study of these weapons on the western frontier reinforces the notion that they were favored by the Tongs, gangs and drifters who monopolized the political economy of violence within the Chinese-American community. The Bancroft library provides the earliest evidence I have yet found for hudiedao-type weapons in an engraving produced by the “Wild West Office, San Francisco.” This picture depicts a battle between two rival Tongs (communal organizations that were often implicated in violence) at Weaverville in October, 1854. Earlier that year the two groups, Tuolomne County’s Sam Yap Company and the Calaveras County Yan Wo Company, had nearly come to blows. Both groups closed ranks, began to order weapons (including helmets, swords and shields) from local craftsmen, and spent months drilling as militia units. However, the two sides were far from evenly matched. The Sam Yap Company ordered 150 bayonets and muskets in San Francisco and hired 15 white drill instructors. The Yan Wo Company may also have had access to some firearms, but was generally more poorly provided. Period accounts indicate that about 2,000 individuals (including the 15 western military advisers) clashed at a place called “5 Cent Gulch.” The fighting between the two sides was brief. After a number of volleys of musket fire the much more poorly armed Yan Wo Company broke ranks and retreated. Casualty figures vary but seem to have been light. Some reports indicate that seven individuals died in the initial clash and another 26 were seriously wounded. The conflict between these two companies was a matter of some amusement to the local white community who watch events unfold like a spectator sport and put bets on the contending sides. An engraving of the event was sold in San Francisco. Under normal circumstances this might not be considered very reliable evidence of the presence of hudiedao or other traditional weapons. However, both the Weaverville museum and the local Daoist Temple (now a California State Park and historic landmark) have preserved some of the actual weapons from this battle. Crude, locally produced, Butterfly swords (complete with D-guards), tridents and daos are indeed in this collection. These may be some of the earliest documented traditional Chinese weapons in the United States. While a sad historical chapter, the 1854 Weaverville War is interesting to students of Chinese Martial Studies on a number of fronts. It is a relatively well documented example of militia organization and communal violence in the southern Chinese diaspora. The use of outside military instructors, reliance on elite networks and mixing of locally produced traditional weaponry with a small number of more advanced firearms are all typical of the sorts of military activity that we have already seen in Guangdong. Of course these were not disciplined, community based, gentry led militias. Instead this was inter-communal violence organized by Tongs and largely carried out by hired muscle. This general pattern would remain common within immigrant Chinese communities through the 1930s. Given that the first known Chinese martial arts schools did not open in California until the 1930s, the accounts of the militia training in Weaverville are also one of our earliest examples of the teaching of traditional Chinese fighting methods in the US. The degree to which any of this is actually similar to the modern martial arts is an interesting philosophical question. I plan to further explore these events, and their implications for our understanding of southern Chinese martial culture in an upcoming post. 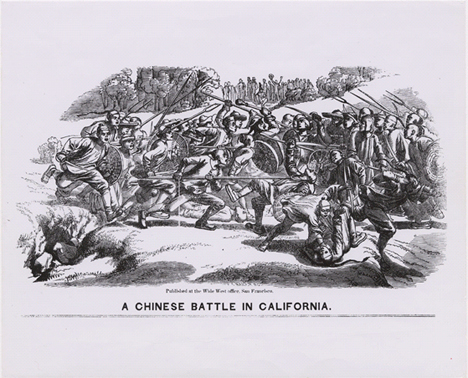 “A Chinese Battle in California.” Depiction of rival tongs of Chinese miners at Weaverville in June 1854. Contributing Institution: California Historical Society. Bancroft Library, UC Berkley. Volkerkunde by F.Ratzel.Printed in Germany,1890. 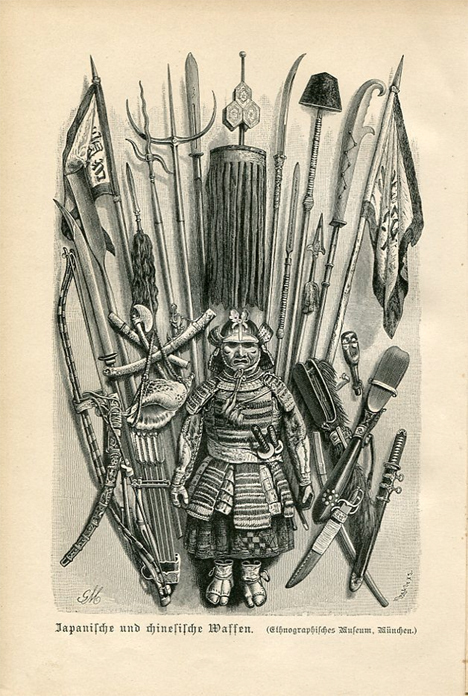 This 19th century illustration shows a number of interesting Asian arms including hudiedao. The print does a good job of conveying what a 19th century arms collection in a great house would have looked like. While the origins of photography stretch back to the late 1820s, reliable and popular imaging systems did not come into general use until the 1850s. This is the same decade in which the expansion of the treaty port system and the creation of Hong Kong increased contact between the Chinese and westerns. Increasingly photography replaced private collections, travelogues and newspapers illustrations as the main means by which westerns attempted to imagine and understand life in China. Various forms of double swords occasionally show up in photos taken in southern China. One of the most interesting images shows a rural militia in the Pearl River Delta region near Guangzhou sometime in the late 1850s (Second Opium War). The unit is comprised of seven individuals, all quite young. Four of them are armed with shields, and they include a single gunner. Everyone is wearing a wicker helmet (commonly issued to village militia members in this period). The most interesting figure is the group’s standard bearer. In addition to being armed with a spear he has what appears to be a set of hudiedao stuck in his belt. The D-guards, quillions and leather sheath are all clearly visible. Due to the construction of this type of weapon, it is actually impossible to tell when it is a single sword, or a double blade fitted in one sheath, when photographed from the side. Nevertheless, given what we know about the official orders for arming the militia in this period, it seems likely that this is a set of “double swords.” The next image in the series confirms that these are true hudiedao and also suggests that the blades are of the long narrow stabbing variety. This style of sword is also evident in the third photograph behind the large rattan shield. These images are an invaluable record of the variety of arms carried by village militias in Guangdong during the early and mid. 19th century. 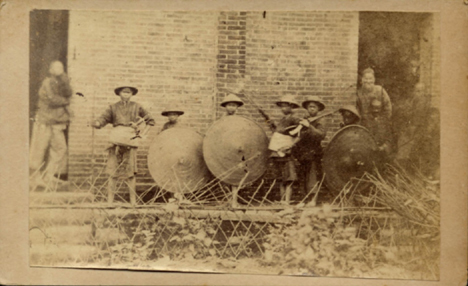 Rural militia in Guangdong, Pearl River Delta, taken sometime during the Second Opium War (1856-1860). Source http://www.swordsantiqueweapons.com. Another picture of the same young militia group. Luckily the hudiedao of the leader have become dislodged in their sheath. We can now confirm that these are double blades. They are of the long narrow stabbing variety seen in some of the prior photographs. Source http://www.swordsantiqueweapons.com. A third picture from the same series. Note the long thin blade being held behind the rattan shield by the kneeling soldier. The individual with the spear also appears to be armed with a matchlock handgun. Source http://www.swordsantiqueweapons.com. The next photograph from the same period presents us with the opposite challenge. It gives us a wonderfully detailed view of the weapons, but any appropriate context for understanding their use or meaning is missing. Given it’s physical size and technology of production, this undated photograph was probably taken in the 1860s. It was likely taken in either San Francisco or Hong Kong, though it is impossible to rule out some other location. On the verso we find an ink stamp for “G. Harrison Gray” (evidently the photographer). Images like this might be produced either for sale to the subject (hence all of the civil war portraits that one sees in American antique circles), or they might have been reproduced for sale to the general public. Given the colorful subject matter of this image I would guess that the latter is most likely the case, but again, it is impossible to be totally certain. 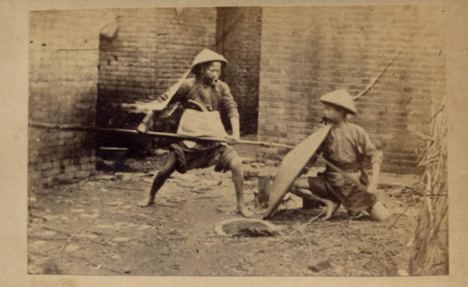 The young man in the photo (labeled “Chinese Soldier”) is shown in the ubiquitous wicker helmet and is armed only with a set of exceptionally long hudedao. These swords feature a slashing and chopping blade that terminates in a hatchet point, commonly seen on existing examples. The guards on these knives appear to be relatively thin and the quillion is not as long or wide as some examples. I would hazard a guess that both are made of steel rather than brass. Given the long blade and light handle, these weapons likely felt top heavy, though there are steps that a skilled swordsmith could take to lessen the effect. 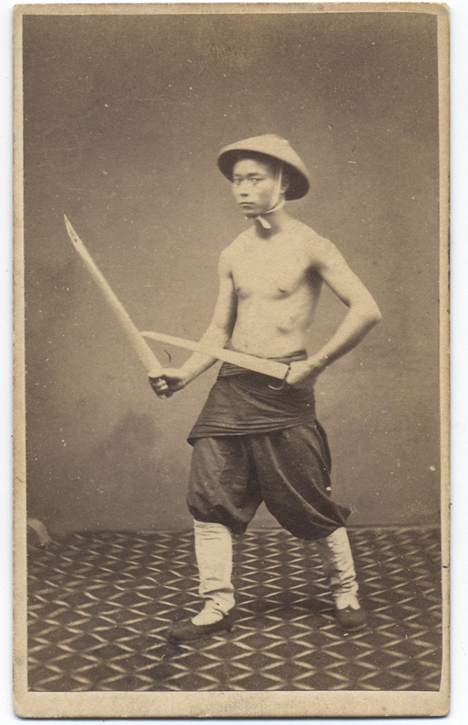 1860s photograph of a “Chinese Soldier” with butterfly swords. Subject unknown, taken by G. Harrison Gray. It is interesting to note that the subject of the photograph is holding the horizontal blade backwards. It was a common practice for photographers of the time to acquire costumes, furniture and even weapons to be used as props in a photograph. It is likely that these swords actually belonged to G. Harrison Gray or his studio and the subject has merely been dressed to look like a “soldier.” In reality he may never have handled a set of hudiedao before. While guns came to dominate the world of violence in China during the late 19th century, traditional weaponry never disappeared. There are probably both economic and tactical reasons behind the continued presence of certain types of traditional arms. 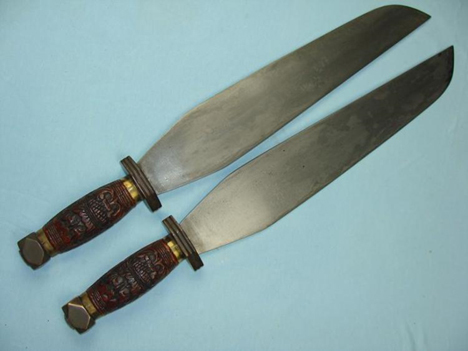 In general, fighting knives and hudiedao seem to have remained popular throughout this period. The same trend was also seen in America. On Feb. 13th, 1886, Harper’s Weekly published a richly illustrated article titled “Chinese Highbinders” (p. 103). This is an important document for students of the Chinese-American experience, especially when asking questions about how Asian-Americans were viewed by the rest of society. Readers should carefully examine the banner of the engraving on page 100. It contains a surprisingly detailed study of weapons confiscated from various criminals and enforcers. As one would expect, handguns and knives play a leading role in this arsenal. The stereotypical hatchet and cleaver are also present. More interesting, from a martial arts perspective, is the presence of various types of maces (double iron rulers and a sai), as well as an armored shirt and wristlets. The collection is finished off with a classic hudiedao, complete with D-guard and shared leather scabbard. It seems that the hudiedao actually held a certain amount of mystic among gangsters in the mid 1880s. The author notes that these weapons were imported directly from China. This image was scanned by UC Berkeley, Bancroft Library. “The weapons of the Highbinder are all brought from China, with the exception of the hatchet and the pistol. 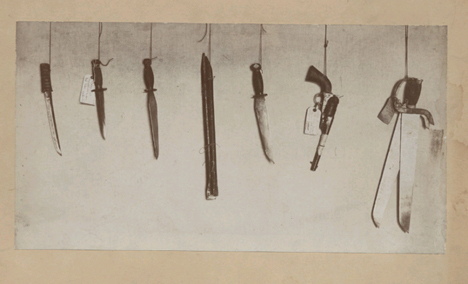 The illustration shows a collection of Chinese knives and swords taken from criminals, and now in the possession of the San Francisco police. The murderous weapon is what is called the double sword. Two swords, each about two feet long, are worn in a single scabbard. A Chinese draws these, one in each hand, and chops his way through a crowd of enemies. Only one side is sharpened, but the blade, like that of all the Chinese knives, is ground to a razor edge. An effective weapon at close quarters is the two-edged knife, usually worn in a leather sheath. The handle is of brass, generally richly ornamented, while the blade is of the finest steel. Most of the assassinations in Chinatown have been committed with this weapon, one blow being sufficient to ensure a mortal wound. The cleaver used by the Highbinders is smaller and lighter than the ordinary butcher’s cleaver. The iron club, about a foot and a half long, is enclosed in a sheath, and worn at the side like a sword. Another weapon is a curious sword with a large guard for the hand. The hatchet is usually of American make, but ground as sharp as a razor. 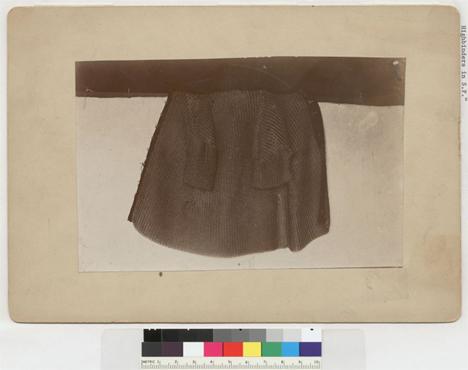 The coat of mail shown is the sketch, which was taken from a Chinese Highbinder, is of cloth, heavily padded with layers of rice paper that make it proof against a bullet, or even a rifle ball. This garment is worn by the most desperate men when they undertake a peculiarly dangerous bit of assassination. More common than this is the leather wristlet. This comes halfway up to the elbow, and pieces of iron inserted in the leather serve to ward off even a heavy stroke of a sword or hatchet.” (Feb 13, 1887. Harper’s Weekly. P. 103). These passages, based on interviews with law enforcement officers, provide one of the most interesting period discussions of the use of “double swords” among the criminal element that we currently possess. These weapons were not uncommon, but they were feared. They seem to have been especially useful when confronting crowds of unarmed opponents and were frequently employed in targeted killings. It is also interesting to note that their strong hatchet-points and triangular profiles may have been a response to the expectation that at least some enemies would be wearing armor. Desperate men and hired thugs were not the only inhabitants of San Francisco’s Chinatown to employ hudiedao in the 19th century. Both Cantonese Opera singers and street performers also used these swords. During the early 1900s, a photographer named Arnold Genthe took a series of now historically important photographs of San Francisco’s Chinese residents. These are mostly street scenes portraying the patterns of daily life, and are not overly sensational or concerned with martial culture. One photo, however, stands out. In it a martial artist is shown performing some type of fighting routine with two short, roughly made, hudiedao. Behind him on the ground are two single-tailed wooden poles. These were probably also used in his performance and may have helped to display a banner. Period accounts from Guangzhou and other cities in southern China frequently note these sorts of transient street performers. They would use their martial skills to attract a crowd and then either sell patent medicines, charms, or pass a hat at the end of the performance. This is the only 19th century photograph that I am aware of showing such a performer in California. The lives of these wandering martial artists were not easy, and often involved violence and extortion at the hands of either the authorities or other denizens of the “Rivers and Lakes.” Many of them were forced to use their skills for purposes other than performing. Arnold Genthe collected information on his subjects, so we have some idea who posed for in around 1900. Arnold Genthe and Will Irwin. Genthe’s Photographs of San Francisco’s Old Chinatown. New York: Mitchell Kennerley. 1913. (First published in 1908). A high resolution scan of the original photograph can be found at the Bancroft Library, UC Berkley). Dainu’s hudiedao are shorter and fatter than most of the earlier 19th century models that have been described or shown above. One wonders whether this style of shorter, more easily concealed, blade was becoming popular at the start of the 20th century. These knives seem to be more designed for chopping than stabbing and are reminiscent of the types of swords (bat cham dao) seen hanging on the walls of most Wing Chun schools today. Lin expected his militia to fight the British with these weapons, and the swords shown in G. Harrison Gray’s photograph are clearly long enough to fence with. In contrast, Dainu’s “swords” are basically the size of large 19th century bowie knives. They are probably too short for complex trapping of an enemy’s weapons and were likely intended to be used against an unarmed opponent, or one armed only with a hatchet or knife. The next photograph was also taken in San Francisco around 1900. 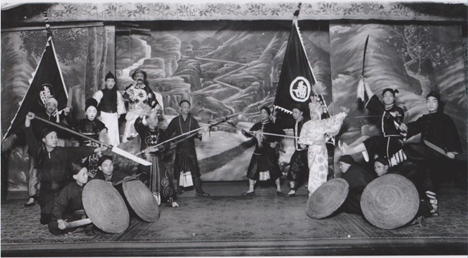 It shows a Cantonese opera company putting on a “military” play. The image may have originally been either a press or advertising picture. I have not been able to discover who the original photographer was. It is interesting to consider the assortment of weapons seen in this photograph. 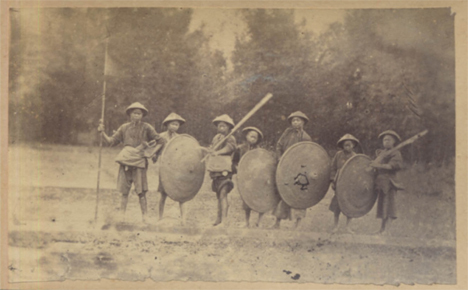 A number of lower status soldiers are armed with a shield and single hudiedao shaped knife. More important figures in heroic roles are armed with a pair of true hudiedaos. Lastly the main protagonists are all armed with pole weapons (spears and tridents). Cantonese Opera Performers in San Francisco, circa 1900. This picture came out of the same milieu as the one above it. Notice the wide but short blades used by these performers. Such weapons had a lot visual impact but were relatively safe to use on stage. Cantonese opera troops paid close attention to martial arts and weapons in their acting. While their goal was to entertain rather than provide pure realism, they knew that many members of the audience would have some experience with the martial arts. This was a surprisingly sophisticated audience and people expected a certain degree of plausibility from a “military” play. It was not uncommon for Opera troops to compete with one another by being the first to display a new fighting style or to bring an exotic weapon onstage. Hence the association of different weapons with individuals of certain social classes in this photo may not be a total coincidence. It is likely an idealized representation of one aspect of Cantonese martial culture. Fighting effectively with a spear or halberd requires a degree of subtlety and expertise that is not necessary (or even possible) when wielding a short sword and a one meter wicker shield. We also know that the government of Guangdong was issuing hudiedao to mercenary martial artists and village militias. Higher status imperial soldiers were expected to have mastered the matchlock, the bow, the spear and the dao (a single edged saber). While many surviving antique hudiedao do have finely carved handles and show laminated blades when polished and etched, I suspect that in historic terms these finely produced weapons there were probably the exception rather than the rule. Conclusion: The Hudiedao as a Weapon, Symbol and Historical Argument. Hudiedao’s remained in use as a weapon among various Triad members and Tong enforcers through the early 20th century. For instance, an evidence photo of confiscated weapons in California shows a variety of knives, a handgun and a pair of hudiedao. This set has relatively thick chopping blades and is shorter than some of the earlier examples, but it retains powerful stabbing points. Chinese Highbinder weapons collected by H. H. North, U. S. Commission of Immigration, forwarded to Bureau of Immigration, Washington D. C., about 1900. Note the coexistence of hudiedao (butterfly swords), guns and knives all in the same raid. This collection of weapons is identical to what might have been found in either China or America from the 1860s onward. Courtesy the digital collection of the Bancroft Library, UC Berkley. Chinese coat of mail used by Chinese highbinders in San Fransisco. Contributing Institution: UC Berkeley, Bancroft Library. The possibility of meeting a foe wearing armor (also noted in the Harper’s Weekly article) would certainly explain the popularity of strong stabbing points on some 19th century Hudiedao. Still, “cold weapons” of all types saw less use in the second and third decades of the 20th century as they were replaced with increasingly plentiful and inexpensive firearms. We know that in Republican China almost all bandit gangs were armed with modern repeating rifles by the 1920s. Gangsters and criminal enforcers in America were equally quick to take up firearms. Still, the transition was not automatic. Lau Bun, a Choy Li Fut master trained in the Hung Sing Association style, is often cited as the first individual in America to open a permanent semi-public martial arts school. He also worked as an enforcer and guard for local Tong interests, and is sometimes said to have carried concealed butterfly swords on his person in the 1920s and 1930s. On the opposite coast, a New York newspaper ran a now iconic photograph of the Tong leader Eddie Gong inspecting a pair of hudiedao in 1930. These swords have broad blades which show little narrowing as you approach the tip. The actual point of the sword is rounded and not well adapted to stabbing. In fact, they seem to be built more along the lines of a performance weapon than anything else. On the one hand they are too large for concealed carry, yet they also lack the reach and stabbing ability that one would want in an offensive weapon. Still, Eddie Gong’s hudiedao compare favorably with many of the more cheaply produced copies available to martial artists today. Many experienced fencers and sword collectors are utterly perplexed when they pick up their first set of “bat cham dao,” and openly express wonder that these short, rounded, and poorly balanced blades could actually function as a weapon. Their disbelief is well founded, but it usually evaporates when you place a set of well-made mid-19th century swords in their hands instead. Hudiedao, like many other weapons, developed a certain mystique during the 19th century. They were used in the poorly executed defense of Guangdong against the British. In the hand of the Triads they were a symbol of personal empowerment and government opposition. They were widely used by groups as diverse as local law enforcement officials, traveling martial artists, opera singers and community militias. Their iconic nature probably helped them to survive in the urban landscape well after most other forms of the sword had been abandoned (the dadao being the notable exception). However, by the 1920s these weapons were finally being relegated to the training hall and the opera state. In those environments length, cutting ability and a powerful tip were not only unnecessary, they were an unrewarded hazard. The symbolic value of these weapons was no longer tied to their actual cutting ability. Consider for instance the “bat cham dao” (the Wing Chun style name for butterfly swords) owned by Ip Man. In a recent interview Ip Ching (his son),confirmed that his father never brought a set of functional hudiedao to Hong Kong when he left Foshan in 1949. Instead, he actually brought a set of “swords” carved out of peach wood. These were the “swords” that he used when establishing Wing Chun in Hong Kong in the 1950s and laying the foundations for its global expansion. Obviously some wooden swords are more accurate than others, but none of them are exactly like the objects they represent. It also makes a good deal of sense that Ip Man in 1949 would not really care that much about iron swords. He was not a gangster or a Triad member. He was not an opera performer. As a police officer he had carried a gun and had a good sense of what real street violence was. Ip Man had been (and aspired to once again become) a man of leisure. He was relatively well educated, sophisticated and urbane. More than anything else he saw himself as a Confucian gentleman, and as such he was more likely to display a work of art in his home than a cold-blooded weapon. Swords carved of peach wood have an important significance in Chinese society that goes well beyond their safety and convince when practicing martial arts forms. Peach wood swords are used in Daoist exorcisms and are thought to have demon slaying powers. In the extended version of the story of the destruction of the Shaolin Temple favored by the Triads, Heaven sends a peach wood sword to the survivors of Shaolin that they use to slay thousands of their Qing pursuers. Ip Man with his swords. Hong Kong, late 1960s. Hung in a home or studio, these swords are thought to convey good fortune and a certain type of energy. In fact, it was not uncommon for Confucian scholars to display a prized antique blade or a peach wood sword in their studies. Ip Man’s hudiedao appear to be a (uniquely southern) adaptation of this broader cultural tradition. As carved wooden works of art, they were only meant to have a superficial resemblance to the militia weapons of the early 19th century. Ip Ching also relates that at a later date one of his students took these swords and had exact aluminum replicas of them created. Later these were reworked again to have a flat stainless steel blade and aluminum (latter brass) handles. Still, I think there is much to be said for the symbolism of the peach wood blade. Butterfly swords remain one of the most iconic and easily recognizable artifacts of Southern China’s unique martial culture. 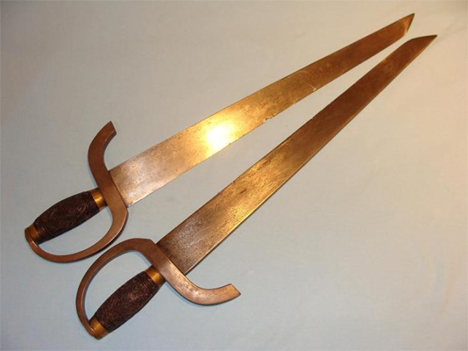 Their initial creation in the late 18th or early 19th century may have been aided by recent encounters with European cutlasses and military hangers. This unique D-grip (seen in many, though not all cases) was then married to an older tradition of using double weapons housed in a single sheath. By the 1820s, these swords were popular enough that American and British merchants in Guangdong were encountering them and adding them to their collections. By the 1830’s, we have multiple accounts of these weapons being supplied to the gentry led militia troops and braves hired by Lin in his conflicts with the British. Descriptions by Commander Bingham indicate the existence of a fully formed martial tradition in which thousands of troops were trained to fight in the open field with these swords, and even to flip them when switching between grips. (Whether flipping them is really a good idea is another matter entirely). 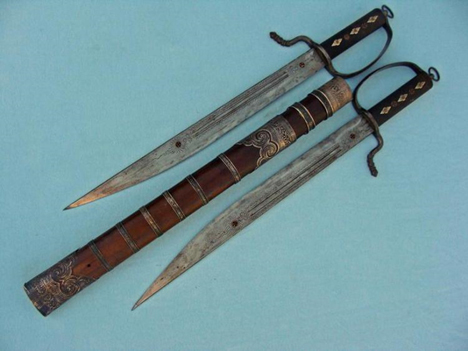 Increased contact between Europeans and Chinese citizens in the 1840s and 1850s resulted in more accounts of “double swords” and clear photographs and engravings showing a variety of features that are shared with modern hudiedao. The biggest difference is that most of these mid-century swords were longer and more pointed than modern swords. Interestingly these weapons also start to appear on America’s shores as Chinese immigration from Guangdong and Fujian increased in the middle of the 19th century. Period accounts from the 1880s indicate that they were commonly employed by criminals and enforcers, and photographs from the turn of the century show that they were also used by both street performers and opera singers. Still, these blades were in general shorter, wider and with less pronounced points, than their mid. 19th century siblings. While some individuals may have continued to carry these into the 1930s, hudiedao started to disappear from the streets as they were replaced by more modern and economical firearms. By the middle of the 20th century these items, if encountered at all, were no longer thought of as fearsome weapons of community defense or organized crime. Instead they survived as the tools of the “traditional martial arts” and opera props. While it has touched on a variety of points, I feel that this article has made two substantive contributions to our understanding of these weapons. First, it pushed their probable date of creation back a generation or more. Rather than being the product of the late 19th century or the 1850s, we now have clear evidence of the widespread use of the hudiedao in Guangdong dating back to the 1830s, and a strong suggestion of their presence in the 1820s. These weapons were indeed favored by civilian martial artists and various members of the “Rivers and Lakes” of southern China. Yet we have also seen that they were employed by the thousands to arm militias, braves and guards in southern China. Not only that we have accounts of thousands of individuals in the Pearl River Delta region receiving active daily instruction in their use in the late 1830s. The popular view of hudiedao as exotic weapons of martial artists, rebels and eccentric pirates needs to be modified. These blades also symbolized the forces of “law and order.” They were produced by the thousands for government backed elite networks and paid for with public taxes. This was a reasonable choice as many members of these local militias already had some boxing experience. It would have been relatively easy to train them to hold and use these swords given what they already knew. While butterfly swords may have appeared mysterious and quintessentially “Chinese” to western observers in the 1830s, Lin supported their large scale adoption as a practical solution to a pressing problem. This may also change how we think about the martial arts that arose in this region. For instance, the two weapons typically taught in the Wing Chun system are the “long pole” and the “bat cham do” (the style name for hudiedao). The explanations for these weapons that one normally encounters are highly exotic and focus on the wandering Shaolin monks (who were famous for their pole fighting) or secret rebel groups intent on exterminating local government officials. Often the “easily concealable” nature of the hudiedao are supposed to have made them ideal for this task (as opposed to handguns and high explosives, which are the weapons that were actually used for political assassinations during the late Qing). 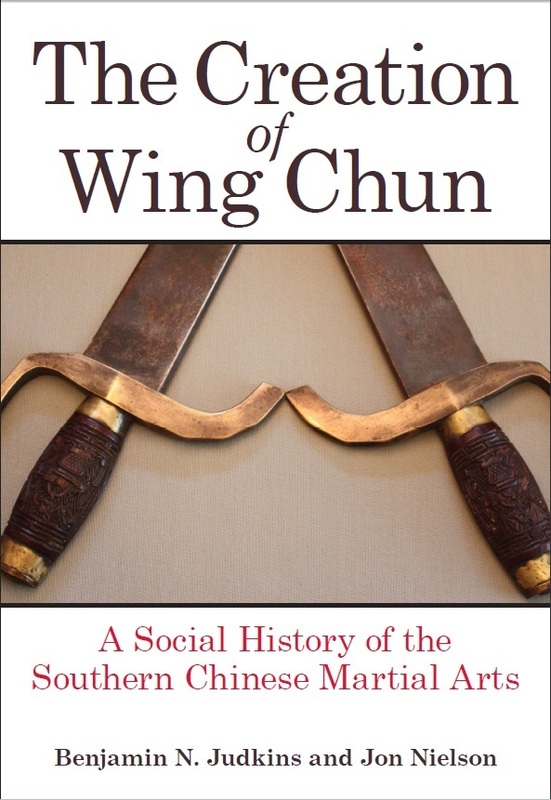 Our new understanding of the historical record shows that what Wing Chun actually teaches are the two standard weapons taught to almost every militia member in the region. One typically learns pole fighting as a prelude to more sophisticated spear fighting. However, the Six and a Half Point pole form could easily work for either when training a peasant militia. And we now know that the butterfly swords were the single most common side arm issued to peasant-soldiers during the mid. 19th century in the Pearl River Delta region. The first historically verifiable appearance of Wing Chun in Foshan was during the 1850s-1860s. This important commercial town is located literally in the heartland of the southern gentry-led militia movement. It had been the scene of intense fighting in 1854-1856 and more conflict was expected in the future. We have no indication that Leung Jan was a secret revolutionary. He was a well We have no indication that Leung Jan was a secret revolutionary. He was a well known and well liked successful local businessman. Still, there are understandable reasons that the martial art which he developed would allow a highly educated and wealthy individual, to train a group of people in the use of the pole and the hudiedao. Wing Chun contains within it all of the skills one needs to raise and train a gentry led militia unit. The evolution of Wing Chun was likely influenced by this regions unique history of militia activity and widespread (government backed) military education. I would not be at all surprised to see some of these same processes at work in other martial arts that were forming in the Pearl River Delta at the same time. 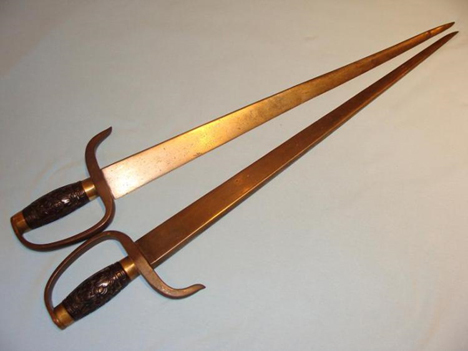 These swords embody elements of both the longer chopping and stabbing types that were popular in the 19th century. Both blades are finely made, well balanced and exhibit long false edges. Total length: 60 cm; Width at bade: 5 cm, width of spine: 10 mm. Source: Author’s personal collection. 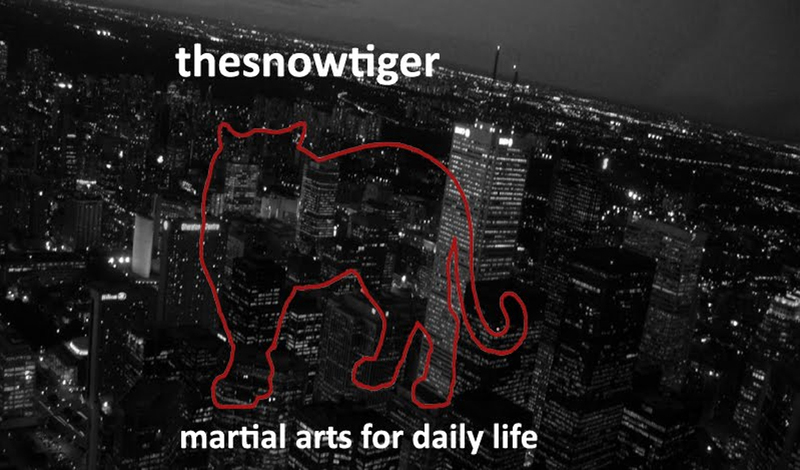 Readers can appreciate the depth of research – and passion for the martial arts - that went into this article. I’ve been a big fan of Ben’s website KUNG FU TEA I encourage readers to visit this site. Ben’s thoughtful approach, and again, the depth and quality of his research his incredible. Ben Judkins has co-authored the wonderful book on Wing Chun shown below with an active link. I highly recommend it to readers! The Creation of Wing Chun: A Social History of the Southern Chinese Martial Arts by Benjamin Judkins and Jon Nielson. State University of New York Press, 2015. This work looks at southern Chinese martial arts traditions and how they have become important to local identity and narratives of resistance. "The actual point of the sword is rounded and not well adapted to stabbing." - This may have been done purposely to reduce the lethality of the weapon. A stabbing weapon has a greater potential to cause death due to its ability to puncture a vital organ. In fights between criminals, an approach is to intimidate your opponent into compliance during business disputes, not kill him which would usually result in a more aggressive police response, and possible prolonged imprisonment, which translates into losses for the criminal organization. The preference for organized crime members in Hong Kong, commonly documented in Hong Kong news and movie sources, to use "watermelon knives" which have superior slicing ability, but reduced lethal potential, supports this theory. "In fact, they seem to be built more along the lines of a performance weapon than anything else." - A stepwise, escalating non-pacifist approach to a dispute is visual intimidation, followed by physical intimidation. We see this in the animal kingdom as well. Thank you for your comment. What you suggest makes sense. While employing butterfly sword forms during practise, I've discovered various levels of control -and opportunity - that one can adapt to different situations. However, within the organizations to which you refer, I've heard that butterfly swords are sometimes substituted with butcher knives yet still using some of the same techniques. I guess, as you say, it would depend on the level of the dispute.